Description: Consists of a selection of stories and articles of general interest. Stories include The Smuggler's Secret and Tribal Foes. Articles include the origins of street names and rescue dogs in Switzerland. Also contains a number of puzzles and quizzes (all are untouched) as well as instructions for making delightful models of cottages and a working windmill. 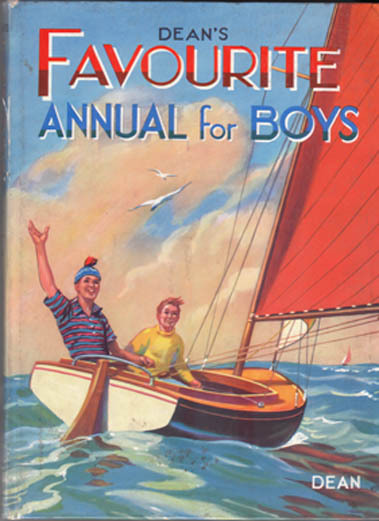 Contains a colour frontispiece depicting a group of schoolboys playing in the sea. Illustrated throughout with b&w line drawings. No date of publication given, but assumed to date from the '40s. Corners slightly bumped on rear cover and some very minor rubbing to the spine. Pages have become tanned, but are free from foxing or other marks. Measures 10.2″ × 7.6″ (25.5 cm × 19 cm). 4to. 125 pp.